Cats love being up high, whether it's to knock things over more easily or to assert dominance over their human counterparts. Now, owners can indulge their cat's altitude-related desires with Goldtatze's series of suspended furniture. 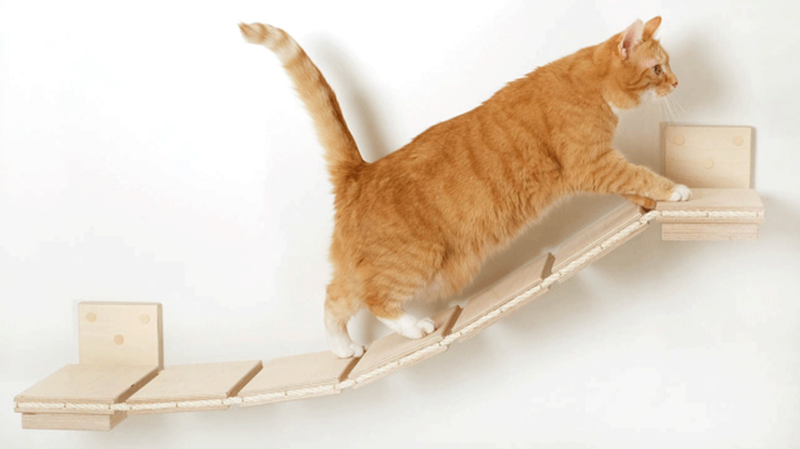 This German-based pet company (Goldtatze translates to "Gold Paw" in English) produces suspended walkways, wall hammocks, and climbing columns, all designed to keep cats comfy and entertained. According to Lost at E Minor, designer Stefan Hoffman was inspired to create the aerial cat furniture as a way of providing extra play space for his cat Mowgli. For any cat owner living in a cramped apartment, Goldtatze's equipment is a smart way to turn unused space into an above-ground sanctuary for your pet. You can browse through all of their products on their website.